With less than two weeks left until Game of Thrones season 7 premieres, comes news that the HBO TV show is getting a touring exhibition. Season 7 is launching months later in its respective year than every previous Game of Thrones season has, making its debut on HBO and its streaming platforms on Sunday, July 16. In season 7, Thrones fans will get to see their Khaleesi arriving in Westeros, the latest intrigue in King’s Landing, the coming advance of the White Walkers - and much more. However, there’s always been more to Game of Thrones than just the TV show. It’s based, of course, on George R.R. Martin’s A Song of Ice and Fire novels, and Martin has written all sorts of side projects set in the Thrones universe. Spinoffs are in the works; there are numerous podcasts about the show, including one that reviews it episode by episode; and when you’re done watching, there are always lots of online recaps to read. Now, there’s word of another place to experience Game of Thrones in the real world. HBO Global Licensing and GES Events has announced plans for Game of Thrones: The Touring Exhibition. 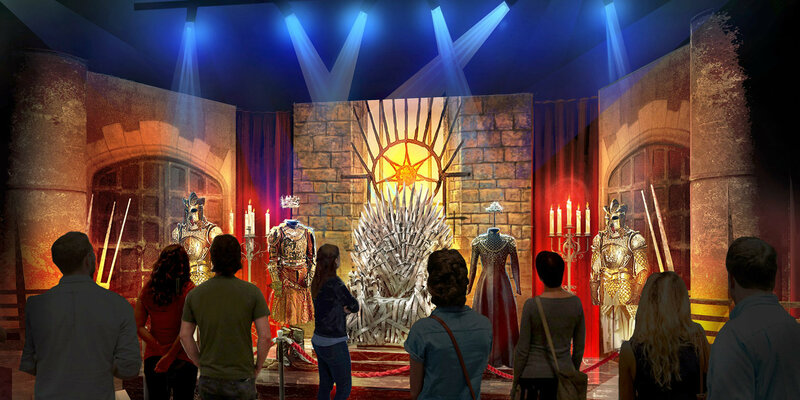 The tour, according to the official press release, will “hit the King’s Road” this fall, with a 10,000-square-foot interactive experience featuring costumes, artifacts, props and much more related to Game of Thrones. The tour launches in the fall, in Europe first. There is no doubt an appreciate for a TV show exhibition like this. Fans really love Game of Thrones, and will be interested in having the chance to see their favorite lands and locations up-close. The tour will launch in the fall, by which point Game of Thrones season 7 will have already wrapped for the year and fans will want their Thrones fix during the wait for season 8 (aka. Thrones' final season). There’s not much precedent for this type of exhibition based on HBO shows past , so the basic idea behind the Game of Thrones exhibit remains untested. Then again, who doesn’t want to sit in the Iron Throne? Game of Thrones season 7 premieres on HBO on Sunday, July 16th. The GES tour launches in Europe this fall.